Eucharist, Communion, Mass, Lord’s Supper. For the first Christians, it was their central activity. It was what they gathered for. Why? The usual story goes like this. On the day before he died, Jesus gathered with the twelve apostles for the kind of meal groups of Jewish men often shared at the Passover Festival, with bread and wine. Jesus said of the bread ‘This is my body’ and of the wine ‘This is my blood’. He also said ‘Do this in remembrance of me’. 150 years after the death of Jesus, and from then on, the standard explanation of the Communion Service has been that Christians are doing what Jesus told them to do at the Last Supper. Being the son of a vicarage I was brought up with it. In the 1970s I was taught it in greater detail at theological college. Being made to write essays about it made me think: this is boring. Have millions of people been doing this for almost 2,000 years just because Jesus once said ‘Do this in remembrance of me’? Jesus also said ‘Sell all your possessions and give the money to the poor’. Why aren’t we all doing that as well? Okay, he only said that to one person, but he only said ‘Do this in remembrance of me’ to 12 people, and they are now all dead. Yet the Eucharist was the central act from the beginning of Christianity. There must have been more to it. Then I discovered some New Testament scholars with a different account of what Jesus was about. What follows is my own understanding, drawing on a variety of scholars I find convincing. From all the evidence we’ve got, it took 150 years before anybody associated the Eucharist with the death of Jesus or thought they were doing it because of Jesus’ instruction at the Last Supper. During that time no texts make the connection, not even the New Testament accounts of the Last Supper. 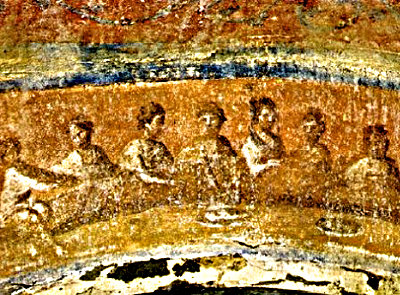 The Christian art of that period, mainly in the catacombs, show people celebrating the Eucharist. There are never 13 of them, which would have been right for the Last Supper, and they never have wine. They are eating bread and fish. Sometimes, five loaves and two fishes. There was an earlier reason for the Eucharist, which has largely been forgotten. What was it? I’ll give you two clues. The first is that term ‘Last Supper’. There must have been previous suppers. The second is the word they used. They didn’t say ‘Communion Service’. They said they were doing a Eucharist, which is a Greek word meaning ‘thank you’. They were thanking God for their suppers. Why is that such a big deal? Jesus started his movement in Galilee. The Jewish tradition believed the world has been created by one good god, who has provided enough food for everybody to eat. When some people go hungry, that’s because other people are taking more than their share. So the Old Testament contains a lot of laws to protect the poor. Interest on loans were forbidden, debts were to be cancelled every seven years. It wasn’t happening in Jesus’ day. Galilee was part of the Roman Empire. The Romans didn’t mind how many Galileans starved to death, provided there were enough left to grow the food and pay the taxes. In the Roman Empire somewhere between five and ten percent of the population were destitute. They had no regular income at all. They would survive as beggars, burglars or bandits until they failed and starved to death. In Galilee, the percentage of destitute people was even higher, more like 15%. Galilee was fertile land, good for growing food. The reason for the starvation was basically taxes. Jesus preached about the Kingdom of God. What he meant by that was how we would live if we did things God’s way. If we did things God’s way everybody would have enough to eat. People are starving because of the Roman taxes. On the other hand, despite the Roman taxes, between us we still have some food. Why don’t we pool our resources, come together bringing what we’ve got, and share it out equally? It was a kind of food insurance policy. One day you get a job as a day labourer, you are paid a bit of money, you spend it on food, and share it with the others. The next day somebody else gets a paid job and they share it, so you still eat. On a practical level it made sense to those people. What gave it wider appeal was the conviction that went with it. God has designed the world so that when we care for each other, we all get what we need. God makes the crops grow, so instead of lamenting how little we’ve got we thank God for what we do have. We express our thanks by sharing what we have with people in need. This was how to live God’s kingdom despite the Romans. To me, this is a far better explanation of the Eucharist. It explains why it was the central act for the early Christians. They didn’t begin it after the Last Supper; they just carried on doing what Jesus had started up. It was absolutely important because it meant real food for the starving. It was also important because it gave those starving people dignity. They were not receiving hand-outs from benevolent charities. They were eating what God had given for them to eat. For them to eat was God’s justice, God’s kingdom. In the Roman Empire, Galilee was a backwater. The ruling classes didn’t care what went on in Galilee. Yet 300 years after Jesus, Christianity became the official cult of the Empire. Historians still argue about how that happened. The pious say it was the Holy Spirit, busier than usual, converting people. Sceptics say it was just a succession of accidents. To me, the most convincing explanation is the Eucharist. All over the Roman Empire there were people starving. The new Christian movement offered food with dignity. Along with the food came a philosophy of life: for everyone to have enough to eat is the way God intends, the way life should be, the Kingdom of God. 25 years after the death of Jesus, Christians at Corinth had inherited the thanksgiving meal in the name of God’s kingdom, but adapted it to the normal practice of Greek dinner parties. Paul complains that they miss the whole point, because they are eating separately, eating different amounts of food, and taking positions of rank and status. Yet, the Corinthians had to adapt it somehow. After all, some of them had homes where they could eat. So do Christians today. We too have to adapt it somehow. Yet we also want to retain Jesus’ vision of the Kingdom of God. So how should we adapt it? When we kneel at the altar rail for a symbolic piece of bread and sip of wine, are we doing the same thing? Is the food bank a better expression of what Jesus began? This entry was posted in Bible, Churches, Theology and tagged Communion, early Christianity, Eucharist, food, Jesus, Kingdom of God, Last Supper, poverty. Bookmark the permalink.